168 pages | 9 B/W Illus. Though their primary concern, organizations in the creative industries don’t only succeed or fail based on the exercise of their creative resources. Their fortunes also depend on their understanding and approach to the problem of competition. 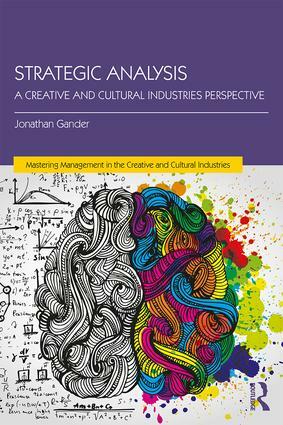 In Strategic Analysis: A creative and cultural industries perspective, Jonathan Gander offers a much needed introduction to how the practice of strategic thinking and analysis can be applied to this diverse and dynamic field. The book employs a range of competitive scenarios and case studies in which to practically apply a recommended set of analytical frameworks and examine the strategic challenge facing the enterprise and the wider sector. This concise and practical text focuses on providing a clear series of steps through which to identify and tackle strategic issues facing an enterprise, making it perfect reading for students and practitioners in the creative sector who seek a strategic understanding of the competition they are involved in. Jonathan Gander is Head of the Department of Creative and Cultural Industries at Kingston School of Art, Kingston University, London. Recent publications include papers on business model innovation (Advances in Strategic Management) creative project management (Management Decision) and fashion designer entrepreneurship (Industry and Innovation). He holds a Politics degree from the University of Sheffield, an MBA from Westminster University and a PhD in Creative and Cultural Industries from King’s College London.